Describe how Distributed Marketing works. Explain how journey templates help you create better journeys. Describe the GDPR compliance strategy for Marketing Cloud. Describe the latest feature updates for Email Studio, Advertising Studio, and other Marketing Cloud features. Connect corporate marketing with financial advisors, insurance agents, auto dealerships, and more. 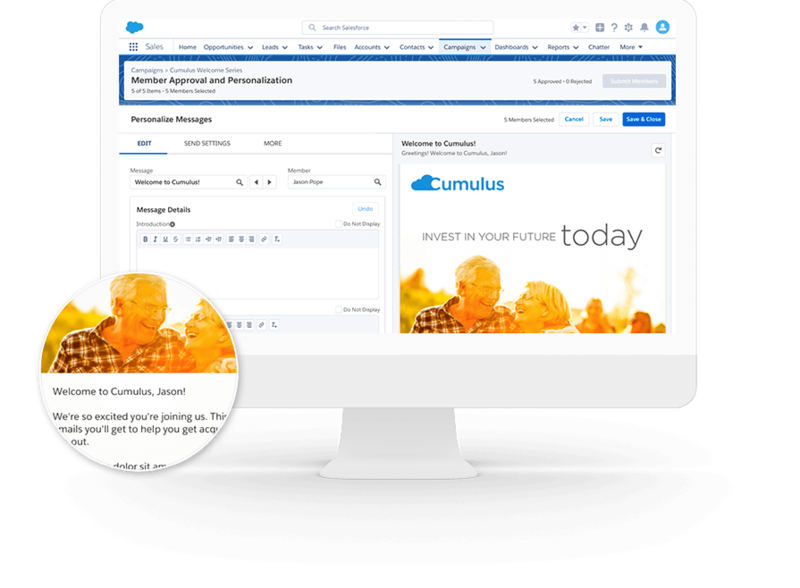 With Distributed Marketing from Salesforce, corporate marketers can prebuild personalized consumer journeys with Marketing Cloud and deploy them to their partner networks (including franchise owners, financial advisors, insurance agents, and more). From there, partners using Sales Cloud, Service Cloud, or Community Cloud can easily manage and personalize these consumer journeys. Learn more about Distributed Marketing. Create journeys with confidence and ease. Create new journeys from a set of predefined templates based on known best practices. These templates provide a guided setup, content recommendations, and flexibility to customize for specific use cases. Learn more about Journey Templates. On May 25, 2018, a new landmark privacy law called the General Data Protection Regulation (GDPR) takes effect in the European Union. Marketing Cloud GDPR readiness will address four key areas: consent management, data deletion (right to be forgotten), restriction of processing, and data portability. We are developing features that will be delivered across our next two releases to be ready for the May 25 compliance date. 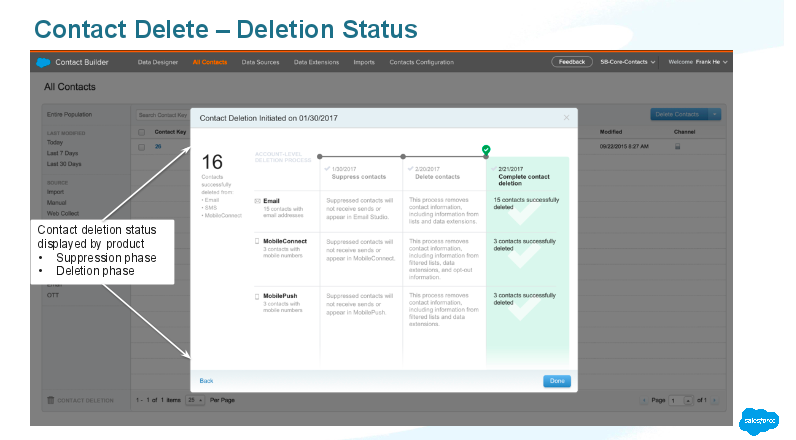 Learn more about GDPR Compliance Support for Marketing Cloud. 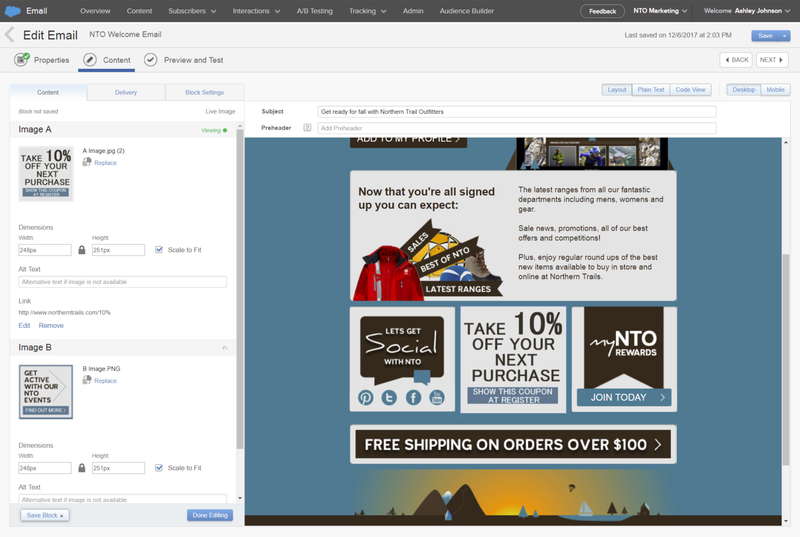 Email marketers can quickly and easily build ads and place them into the context of a journey. 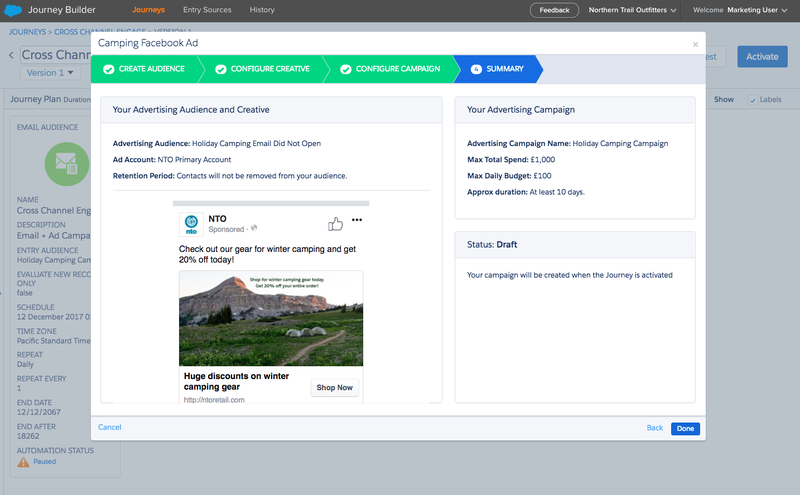 Create Facebook advertising campaigns directly within Journey Builder. 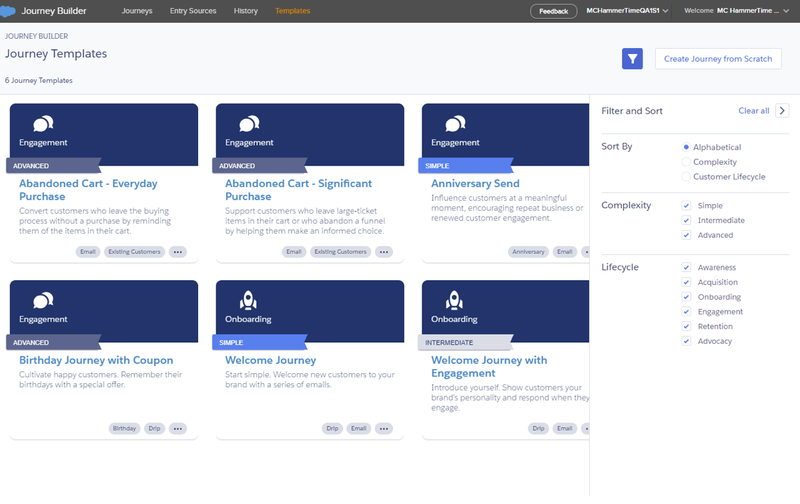 Marketers can now build cross-channel journeys by combining email, mobile, and Facebook advertising without needing to involve a separate digital advertising team or agency. Learn more about Journey Builder Advertising. Change or expire images in your email at any time with drag-and-drop ease. Send emails that render images at the time of open without writing any code. Marketers can update what image is being displayed, even after the email is sent, allowing them to send coupons and other content that can expire or change as needed. Learn more about Live Images Content Block. Gain even more intelligence from social media conversations. Gain more insights from conversations about your brand on social media. 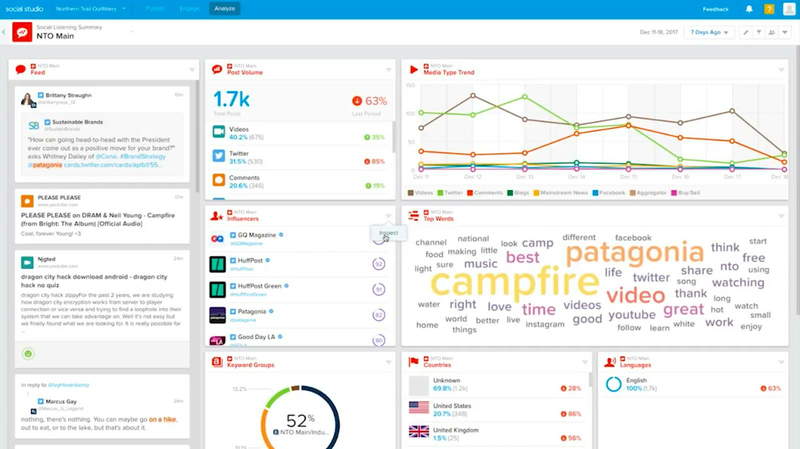 Let Salesforce Einstein identify influencers and present them in your dashboard for further analysis. You can gain key conversation insights like age, gender, and city to help you understand the “who and where” of conversations. Learn more about Influencer & Demographic Insights. Easily reach customers and prospects at the right frequency. Audience Studio can create segments with highly granular control over ad delivery across all media partners to ensure the optimal number of ads is received. In multichannel campaigns spanning display, video, and mobile, ensure underexposed users get more ads so they are more likely to convert—and limit the number of ads users receive to avoid wasted media spend. Global Delivery Management is easier than ever, thanks to an intuitive new UI and granular controls. 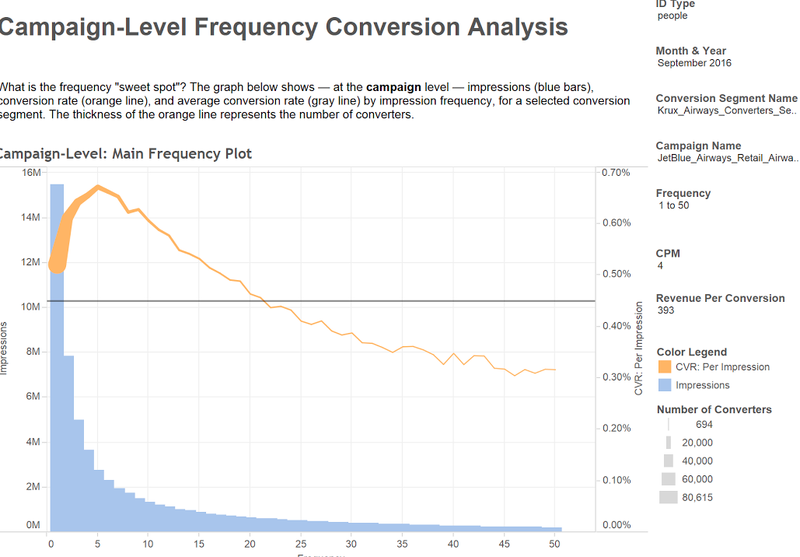 Maximize marketing ROI with multi-touch attribution analytics. 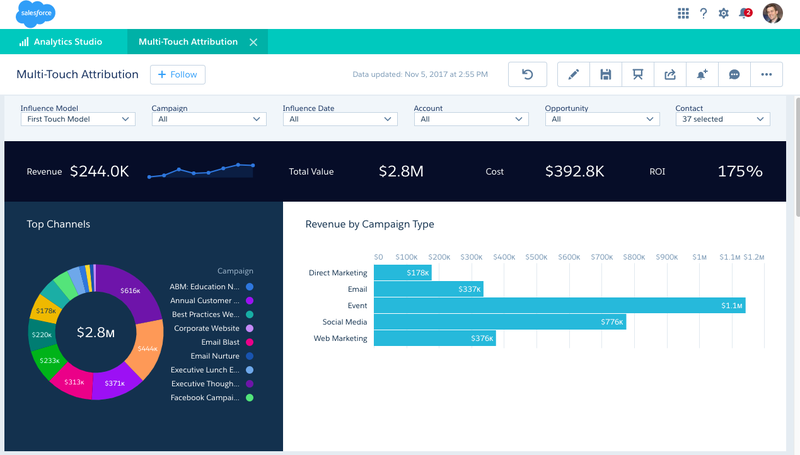 With B2B Marketing Analytics, marketers can visualize campaign ROI across the funnel to prioritize the channels and programs that work best. With first, even, and last touch attribution, marketers gain insights into which channels drive awareness, perform across all buying stages, and help drive deals to close.